"What we`ve got to figure out is whether all the talk we`re doing about this race will fire up Democrats to try to prevent a loss, a stunning loss, really, if it were to happen." 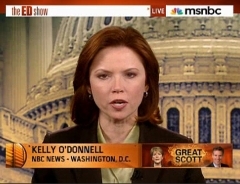 So said NBC's Kelly O'Donnell Friday during a discussion about the upcoming special senatorial election in Massachusetts. KELLY O`DONNELL, NBC NEWS - WASHINGTON, D.C.: Well, when you hear from Democrats and Republicans the same story about a race like this, then you get a sense that there really is something here. We have thought that all the drama in this race would be which Democrat would win the primary back in December. No one thought that Martha Coakley, the very popular attorney general in Massachusetts, would have any trouble, so what has happened? Well, there are a few different kinds of forces at work here, Ed. Part of it is the big picture that doesn`t directly have to do with these two candidates, a sense that there is a mood change in the country. Is this a way to speak to the whole issue of the Obama presidency and the direction of the country, frustrations about health care, about the expanding deficit. There are people who are saying that this is a way to send a signal about those issues. At the same time, Martha Coakley as an individual candidate has frustrated some Democrats for not running as hard as they might have liked and making a few missteps along the way. So then who is this Scott Brown? Well, he was really not even very well-known in Massachusetts. He`s a guy who has managed to not paint himself as a typical Republican, which is exactly what Democrats are trying to do. So he talks about being an independent thinker. He had help today from Rudy Giuliani, Martha Coakley had help today from President Clinton, those big names trying to campaign to bring more energy, the big difference that everyone is talking about is which set of voters is more motivated to go to the polls on a January day. There might be snow, it`s going to be cold, it`s a special election. Right now, people are saying conservatives and Republicans and perhaps leaning independents might be more energized. What we`ve got to figure out is whether all the talk we`re doing about this race will fire up Democrats to try to prevent a loss, a stunning loss, really, if it were to happen. Some say Martha Coakley can pull it out, but even if Scott Brown does not win, if he is close, Republicans are saying that`s a victory for them, perhaps a moral victory for them, where they would be able to use that as an inspiration for other races around the country in November`s midterm. So already Republicans are telling me they are just delighted, and they actually feel pretty encouraged because of fund-raising for Tuesday, and Democrats are showing real concern, still optimistic that it can be pulled out, but real concern and that`s why we`re going to see the president there Sunday. I`m going to be going. I`ll be watching it and try to get the feel for it on the ground to be able to tell what it feels like on the ground in Boston. And that`s going to be a big measure of how much of a turnout we might see on Tuesday. How excited will people be about this race -- Ed. Exit question: how many media members will be visibly holding back tears if Brown wins on Tuesday? I can't wait to count them.